Stock image of warsaw, poland. palace of culture and science, downtown. stock image of Warsaw, Poland, March 10, 2019: Office buildings near the Palace of Culture and Science, Warsaw. stock image of WARSAW, POLAND - Mar, 2018 Entrance of Kinoteka at The Palace of Science and Culture in the city center at night. 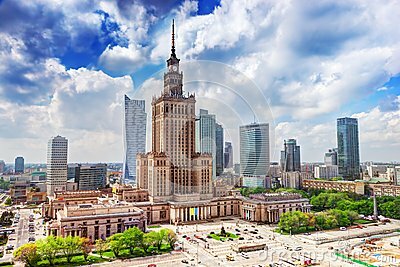 stock image of View on Palace of Culture and Science in Warsaw, Poland. stock image of Warsaw / Poland - 02.16.2016: View at the peak of Palace of Culture and Science.